The information contained in this support note is for IT administrators. MSSQL is not part of Calxa and these instructions herein are provided as a guide only and should be confirmed with the appropriate Microsoft documentation. Failed to connect to <Server Name>\<Instance Name>. A network-related or instance specific error occurred while establishing a connection to SQL Server. This error usually means that the SQL Server computer can't be found or that the TCP port number is either not known, or is not the correct port number, or is blocked by a firewall. This support note should help you identify which of these factors is the root cause of the connection failure. Ensure you have configured your SQL Server for network access and restarted the SQL Server services. This means that the TCP/IP protocol is enabled and the Browser service is running. In the SQL Server Configuration Manager, if your instance is named MSSQLSERVER then this is the default (unnamed) instance. Check Windows Firewall rules to ensure communication is not being blocked. You may try temporarily disabling your firewall to determine if this is the cause. 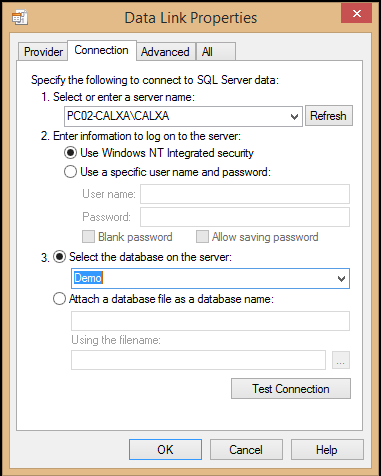 Ensure the SQL Login has appropriate permissions on the SQL Server and Calxa database. If using a domain group for your SQL Login, ensure the windows user is part of the domain group. The further troubleshooting steps outlined in this help note are indicative of the most common problems found by our support team, but may not include all possible causes of connection failure. Please refer to this TechNet article for an exhaustive list of troubleshooting steps: How to Troubleshoot Connecting to the SQL Server Database Engine. Using a Universal Data Link (UDL) can be a quick way to test connections from different machines without the need to install Calxa or other specialised tools. As you go through these troubleshooting steps you can use a UDL to test the connection. Create a notepad file (Text Document) and change the extension to .udl, then save. Note: A warning that changing file extensions can cause files to become unusable might appear. Disregard it. Double-click the universal data link (.udl) file that you have just created. The Data Link Properties dialog box opens, displaying the following tabs: Provider, Connection, Advanced, and All. Choose Next to navigate from tab to tab. 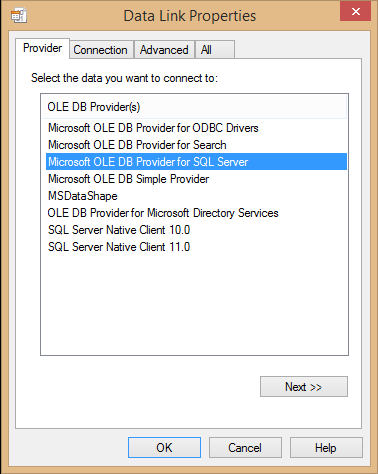 On the Provider tab, select a database provider. On the Connection tab, you can use the drop down menu for the server name field to browse available servers. If all is configured correctly then the server will display but presumably you are reading this support note because it does not. In that case you can type the SQL Server name directly in the format <ComputerName>\<InstanceName>. If you have a database already you can populate this field but it is not required to test a connection to the server. Click Test Connection. 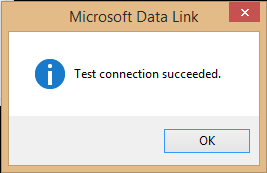 If you receive the connection succeeded message below you are now ready to use the same connection properties in Calxa. You can download a batch file that contains a script that will create the appropriate firewall rules. It is attached at the bottom of this help note. This script has been taken from the Microsoft KB article titled How to open the firewall port for SQL Server on Windows Server 2008. Connecting to the SQL Server using TCP/IP requires that Windows can establish a connection. This means the IP address must be reachable on the network. We will try and ping the machine hosting the SQL Server instance. If you get errors at this point such as "Destination host unreachable." or "Request timed out." double check you have entered the correct serial number. Errors at this point indicate a problem with the client computer, the server or a network problem such as router issues. Errors at this point indicate problems with DNS. Type ipconfig /flushdns in your command prompttoempty theDNS cache and try again. If you can successfully ping the <ComputerName> then we now know the first part of the SQL Server name to use when connecting to the SQL Server. If you cannot ping the <ComputerName>, you could just use the <IP Address> instead of the Server name when connecting from Calxa, but this does indicate that name resolution is not configured correctly.